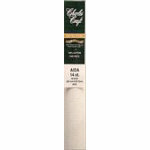 Home > Notions > Aida Cloth 14 White 15"x18"
Aida Cloth 14 White 15"x18"
The finest quality Cross Stitch Aida fabric made. Woven from 100 Cotton, spun especially for Aida. Clear container keeps the fabric free of folds and creases and is great for storing your project and supplies.